The pace of change in transfusion medicine is relentless, with new scientific and technological developments. In addition, efforts are continuing to improve clinical transfusion practice and avoid the use of blood wherever possible. 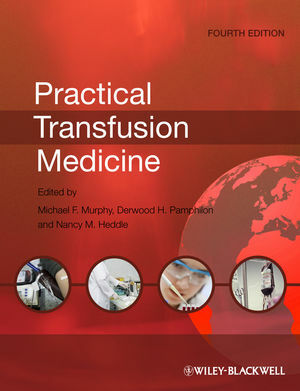 This fourth edition continues to be a concise and comprehensive guide to transfusion medicine. It has been thoroughly revised and updated throughout. The scope of the book has been broadened by including more international authors and a new co-editor, Professor Nancy Heddle, an expert in evidence-based transfusion medicine. This book is ideal for trainee/resident haematologists revising for examinations and as a reference source for clinical and scientific staff working in the field of transfusion medicine. Professor Michael F. Murphy, Consultant Haematologist, Department of Haematology, NHS Blood & Transplant, John Radcliffe Hospital, Oxford, UK. Dr Derwood Pamphilon, Consultant Haematologist, National Blood Service, Bristol, UK. Professor Nancy Heddle, Professor of Medicine, McMaster University, Ontario, Canada; Associate Professor, Department of Medicine and Director of the McMaster Transfusion Research Program (MTRP) and the Quality Essentials for Safe Transfusion (QUEST) Hamilton-Niagara Program.